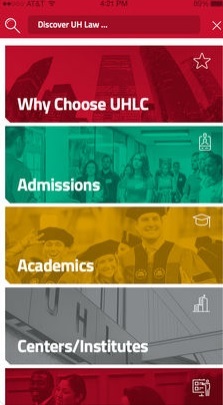 April 19, 2018 – Prospective applicants can now turn their interest in attending the University of Houston Law Center into action with the launch of the UH Law Center mobile app. The app includes updates and information about admissions, academics, centers and institutes, clinics, career development, faculty, alumni, a feed of the Law Center's social media posts and more. It also features a collection of Law Center-related videos. Aspiring students have the option to 'apply now' within the app. 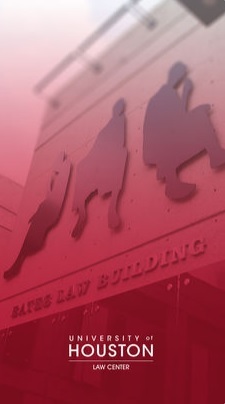 "The app will modernize the Law Center's admissions process," Dean Leonard M. Baynes said. "We are excited that each individual student will have access to this sophisticated technology in a format that they are accustomed to using every day. It should make the application process less complicated and provide the prospective students with information about the Law Center readily available in the palm of their hands." The Law Center made a strategic decision to develop the app to provide a more personalized experience tailored toward the needs and interests of users. The app was created in partnership with Leverage Sports Marketing. "Our goal is to improve overall communications with applicants for the Law Center's JD, LL.M. and part-time programs," added UHLC assistant dean of communications and marketing, Carrie Anna Criado. "Prospective students can obtain all important data on the Law Center in one place and refer back to it throughout the application process as well as keep up-to-date with news, happenings, and events at the Law Center." The UH Law Center app is free and available for download in the App Store (iOS) and in the Google Play Store. Please contact uhlawcom@uh.edu for any feedback, questions or concerns about the app.